Split Oak Forest is off CR 15 south of SR 417. Drive 3.5 miles south and turn left on Clapp-Simms-Duda Road. Follow it 1.5 miles to the parking area on the right. 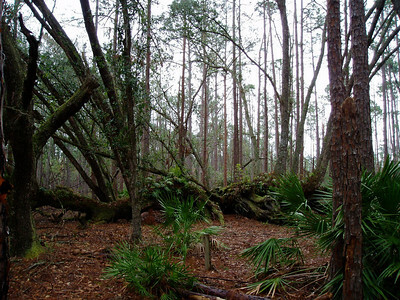 The trail offers level walking through open scrub and prairie, oak hammocks and scrubby flatwoods. From the trailhead, the Cross Trail provides access to the two major loops. Along the South Loop, the south end of the park is primarily open prairie with scattered oak hammocks and a large marsh with an observation deck for birdwatching. The South Loop follows forest roads for the most part, passing through habitat for not just sandhill cranes but also gopher tortoises, indigo snakes, and alligators. The North Loop is the more popular option for a short day hike. It leads you through scrub and scrubby flatwoods to the namesake Split Oak, a live oak tree split in two with its trunk-like branches reaching up to the sky from the prone trunk. The Lake Loop branches off the North Loop and winds through oak hammocks to a spur trail out to Lake Hart and an observation deck on lily-covered Bonnet Pond. The trail system connects with Moss Park, a popular campground and picnic area, via the Swamp Trail, a 0.9-mile causeway through the marshes south of Lake Hart.